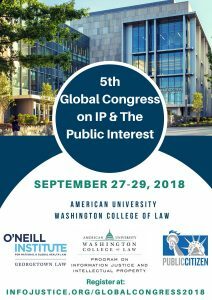 The 5th Global Congress on Intellectual Property and the Public Interest will take place on 24-29 September at the Washington College of Law, American University. It is the main convening of a global network of over 800 researchers, activists, and practitioners who work at the intersection of intellectual property and promotion of the public interest. The core goal is to promote evidence-based policy-making by fostering partnerships between academics and policy advocates from around the world. CREATe is one of the partners of the Global Congress and a CREATe delegation – consisting of Prof. Martin Kretschmer, Dr Thomas Margoni and Bartolomeo Meletti – will participate in various workshops and panel sessions. The Global Congress will also be the platform for the launch of the last two episodes of The Game is On! series, co-created by Prof. Ronan Deazley (Queen’s University Belfast) and Bartolomeo Meletti. On Wednesday 26th September, Bartolomeo will join Ben Cashdan (filmmaker and TV producer, South Africa) and Claudy Op den Kamp (Bournemouth University, UK) in the workshop Demonstrating Fair Use. The purpose of the workshop – held as part of the session User Rights in Domestic Copyright Reform – is to show videos, ad campaigns, animations and other examples of advocacy campaigns on limitations and exceptions to copyright. Bartolomeo will screen the award-winning episode 1 of The Game is On! – The Adventure of the Girl with the Light Blue Hair – illustrating some examples of how the creative team benefitted from copyright exceptions and the public domain in creating the film. He will conclude his talk by showing Copying & Creativity, a short animated video which makes the case for understanding copying as a positive phenomenon in helping us learn and innovate, develop and engage with others. www.CopyrightEvidence.org – a user-generated wiki resource that aims to catalogue all empirical research relating to copyright (currently over 600 studies). www.CopyrightUser.org – the leading UK copyright guidance portal. On Thursday afternoon, Thomas will contribute to a panel Public Interest on EU Copyright Reform, reflecting on CREATe’s participation in the process of EU policy making. Friday 28th: Martin and Thomas will deliver two TED style talks, Thomas on text and data mining, copyright and the impact on open science, Martin on his new study on copyright takedown (with Kris Erickson): “This video is unavailable”. On Friday 28th and Saturday 29th, CREATe will also have a display table showcasing its research-based digital resources. Global Congress attendees will have the opportunity to view exclusive materials such as the annotated scripts of The Game is On! and to provide their input on what datasets should be included in the Copyright Evidence Wiki to facilitate independent research.